as our WOWEE Wednesday Guest Designer. Hi! I'm Melissa Craig and I'm so happy to be a guest today! Just a little about me: I've been stamping and paper crafting for 19 years now and it's been such a fun journey. It is my weekend therapy. I have a little challenge blog called Tuesday Morning Sketches as well as my personal blog Stamp It, Scrap It, Share It where I like to share little tidbits about my family, my cards and projects. I got a Silhouette Portrait for Christmas so I try to incorporate whatever cut I can. As you'll see in my card today. I really love A Random Fan images, they are so adorable. 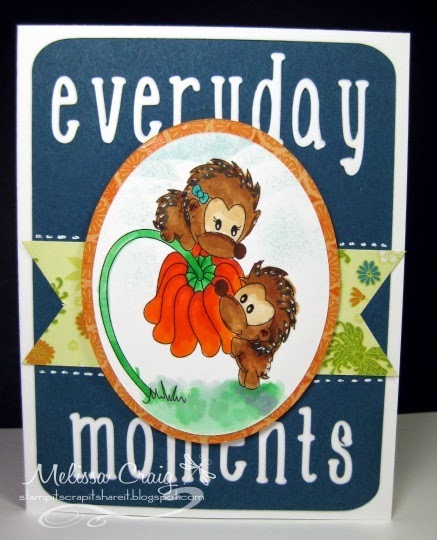 My card features Serendipity and these two little Hedgies are so sweet - I mean, look at those faces! It was challenge for me to color this image, I wanted texture and not muddy up their cuteness. I still don't think I got it right, but they are still quite cute. I did use my Portrait to cut out the background, which is a journal card I made a little bigger and moved "everyday" to the top. I hope you enjoy my card and again thank you for letting me be a guest with you all today. So adorable Melissa!! Those hedgies are too cute!! Challenge #7 - Anything Goes! Challenge #6, Show us your springy Pastel Colors!